At Totally Spain, we’ve been designing custom Spain & Portugal itineraries for clients for over 18 years and often incorporate high-speed trains because they’re fast and comfortable. We also suggest low cost flights in Spain because they can make complex itineraries more accessible especially when time is limited. But these flights have their quirks so here are our 21 tips! We’re not talking about travelling on Iberia, the Spanish national carrier, or Air Nostrum or Air Europa – although these airlines can have special offers worth considering. We are referring to airlines such as Ryanair, Vueling and Volotea that connect Madrid and Barcelona with the smaller boutique Spanish cities but they also connect the second-tier cities with each other; for example, Santander and Valencia, Seville and Bilbao, Seville to Valladolid, Asturias and Malaga, Seville to Vitoria – and the list goes on. Low-cost airlines itemise every element of the flight and charge you. Your ticket gives you the right to board the plane and sit on a seat. If you want a seat with extra legroom, you need to pay extra. If you want a newspaper on low cost flights in Spain, bring it on board or pay extra on the flight. If you want to see a movie, load up whatever you want to see on your iPad and bring your own headphones too. If you want to have a coffee on board, you’ll pay café prices for it. If you want to embark and disembark first, you can pay extra for that service. Almost everything you are offered by a premier carrier is also available on a low-cost flight – but you will have to pay for it. Low-cost airlines change their policies frequently as they refine their business models constantly. We recommend that you read the airline’s website before travelling because what might have been the norm a year ago has probably changed significantly. Take for example, the baggage allowances – these have varied hugely on Ryanair over the past 12 months. 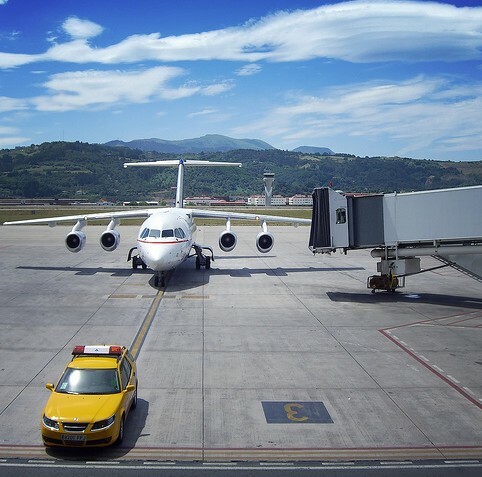 One of the ways that low cost airlines in Spain and elsewhere keep prices down is to fly into smaller, regional airports where landing fees are lower and the airlines often receive grant-assistance from the local governments who are happy to subsidise the airline connection. 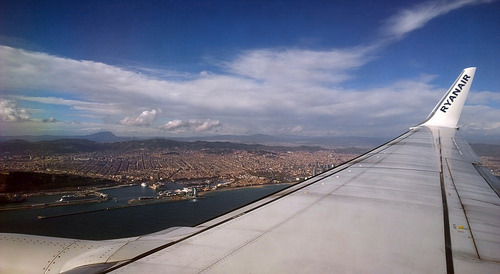 A decade ago, when many of these ‘new’ destinations were selected by the low-cost carriers, the airlines used to disguise the name of the regional airport and promote it under the name of the larger city nearby – for example Santander was often labelled as Bilbao, and Girona as Barcelona – both an hour’s drive apart. Today, the airlines realise that many passengers want to fly into the smaller regional airports and destinations are accurately labelled and marketed. Although the low-cost operators do run call centres, you may spend some time waiting to be attended and will be charged per minute. Ryanair currently charges English-speaking callers from a landline £0.13 per minute plus international calling rates and network extras and your phone company’s access charge. It can increase to 0.34 GBP per minute for other languages. If you need assistance to book or to make amendments to your booking, it’s best to make use of the ‘live chat’ facility on the airline’s website. Vueling also runs a call-centre which costs 0.88 GBP in English (0.91 EUR per minute in Spanish) plus your phone company’s access charge to book a flight. Vueling’s customer service is just the price of a local call. You can also use the Vueling live chat facility. Booking low cost flights in Spain early is vital to get the best prices. If you know your travel dates six months in advance – make sure you not only book your international flights but also book the internal flights. Travel on low-demand days (usually midweek) and you will get a better rate. If you can avoid the expensive travel periods such as Easter, July & August, and Bank Holiday weekends, you’ll find better value for money. The airlines online booking systems allow you to see which days offer best value so use this to guide your decisions. Remember unless you specify a flexible fare – you will not be able to change the dates for the flight or get a refund after booking. Insider Tip: When pricing one-way journeys, note that booking one way might be cheaper with one airline – whereas booking return, might be cheaper with another. Yes, what we are saying is to invent a return date, which you won’t use, but by booking it roundtrip, you get a cheaper overall fare than booking one-way. Be wary of early morning or late at night flights – although they are cheaper, you might find accessing other services to be trickier. If you are travelling with Totally Spain, we can advise on airport transfers and car rentals and all the services available in each airport at your time of arrival. When booking tickets online, sometimes the auto-spellcheck can do strange things especially if you are submitting multiple passengers at the one time. Just make sure that you enter the correct details as it’s easy to make a mistake. The name on a flight booking must be exactly as it appears on your passport. Any deviation will be considered a name change. The state carriers might forgive a slight difference but the low-cost airlines are less understanding and will charge you a fee for a name change. Ryanair (at time of writing) charges 115 EUR (per flight) before travelling and 160 EUR if you turn up at the airport with a slightly different name on the ticket. Vueling (at time of writing) allows you to correct a name within 24 hours of the booking for free but you will need to pay any increase in the price of the flight. After 24 hours, you will need to pay 60 EUR plus the difference in the ticket price. 7 If You Have A Favourite Seat, Book It! Seat allocation is just another way for the low-cost airlines to gain some mark-up as they know many passengers are prepared to pay extra to sit in a window or aisle seat or one of the front-row seats or a seat with extra legroom. Specific seats can be reserved at the time of booking or later when checking in. Vueling currently allows its passengers to choose and pay extra for front row, back row, priority seats and seats with extra legroom. The airlines also know that many passengers are prepared to pay extra to sit beside the person they are travelling with. This is why Ryanair deliberately randomizes seating allocation within a single group booking so if you want to guarantee you are sitting beside your spouse, friend or family member, you have to pay extra. The norm is for children under the age of 2 to sit on an adult’s lap and the adult pays a fee for this service. Children over the age of 2 need a separate seat which usually costs the same price as an adult ticket. The age at which children can travel without an adult varies. On the premium airlines, passengers travelling with small children are often encouraged to board the plane first and get settled before take-off. The low-cost airlines have now begun to charge families for this service when booking the flight. 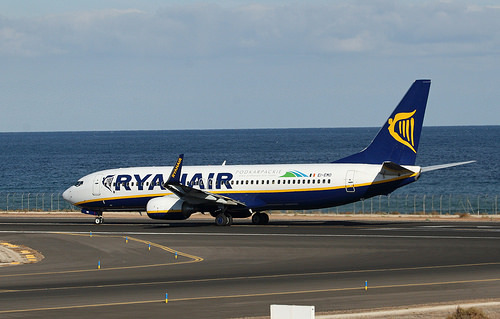 For example, Ryanair’s current policy requires families to pay a premium to ensure family members are seated together. This takes place at the booking stage – you will not be able to purchase a ticket with minors without selecting consecutive seats (and paying extra for them). Low-cost airlines don’t offer a ‘chaperone’ service for children travelling alone. Vueling allows children aged 12-16 to travel alone but does not provide a member of staff to accompany them. On Ryanair, nobody under the age of 16 can travel unaccompanied. The only option in this case is to travel with the premium airline such as Iberia. Our advice is to consult all airline websites carefully when booking to travel with a family as each carrier has different family-related allowances, practices and fees. Many low-cost airlines do not allow you to book connecting flights. Each journey is handled separately and if you are delayed or the first flight is cancelled, you might be compensated for the first flight but not the second – as it’s deemed a ‘no-show’. 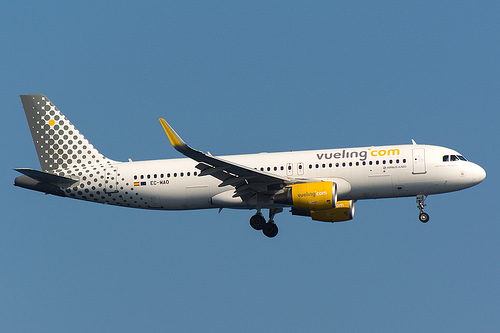 The exception here is Vueling which does recognise connection flights. Whether you check in online and print out a boarding card or you check-in via the App and have the boarding card on your smartphone, you need it available in a suitable format for the airline to scan when you arrive to the airport, when you go through security and when you are at the gate to board and when you board the plane. Each airline has its own time restrictions on check-in. For example, you must check-in online up to 4 hours before departure time with Vueling and up to 2 hours before flying with Ryanair. After checking in, if you lose the printed boarding pass or can’t access the App, the low-cost airlines will charge to re-issue the pass. Ryanair, for example, currently charges 20 EUR to re-issue a boarding card and if you forgot to check-in online, the fee is about 55 EUR. We always recommend that clients arrive early for any flight. Being late is the biggest cause of lost luggage. This is even more important with low-cost airlines as they will not make any allowances for late passengers. If dropping off a hire car at the airport, arrive extra early as some car hire locations are a good distance from Departures and you’ll want to make sure the vehicle is cleared before you leave as it’s hard to discuss any discrepancies later on. Most of the low cost airlines in Spain do not pay for the service of flight announcements to be made on the airport tannoy system. When you are inside Arrivals, you have to find a display panel and check what area of security you need to pass through and what gate you are departing from. Airlines usually don’t charge extra for wheelchair assistance but you will certainly be required to book this in advance. Ryanair, for example, allow you to book this at time of booking the flight. Some airlines have a fixed number of people requiring assistance per flight so book early if you know you need this facility. Remember if you book assistance, you need to arrive at the airport extra early. Vueling suggests arriving 2 hours before your flight leaves. Different airlines have different policies and restrictions as to the size and weight of the luggage that can be brought on board and checked-in and if you breach the restrictions, you might find either a hefty fee for overweight baggage or worse – have to leave the item at the airport. Ryanair allows passengers to carry on board one bag and check in the hold up to 3 suitcases each weighing 20kg. Bags must be booked online in advance and each bag you check in currently costs 25 EUR with a 10 EUR additional supplement over Easter, Summer and Christmas. If you go over this luggage allowance, Ryanair currently charges 11 EUR per kilo for overweight baggage. Excess weight: Be aware when packing that Ryanair will not handle any suitcases that weigh over 33 kg. Vueling also applies penalties for excess luggage. If you have extra heavy luggage, you may find it cheaper and more convenient to courier your suitcases from one hotel to another within Spain. Check out courier services which are also suitable for people travelling with reduced mobility as you will not find porterage at the airports unless you specifically request wheelchair assistance. 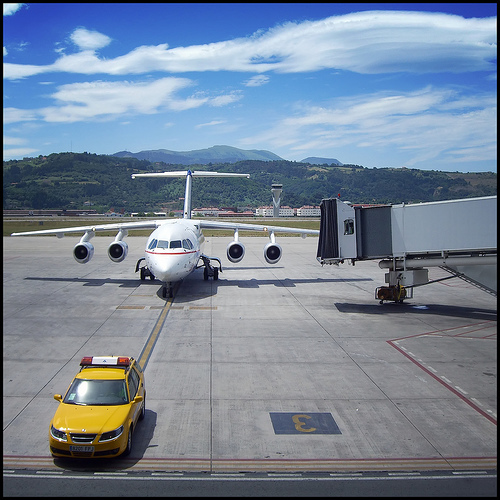 If you need help with your bags, we recommend ordering an airport transfer from your hotel. The driver will always drop you off at the nearest entrance to the luggage check-in and will try to get your bags onto a trolley also. If you are travelling with a case that weighs less than 10kg, it should be fine to bring on board. (Do check the suitcase dimensions comply with your airline’s requirements.) If you have a separate laptop case and/or handbag that does not fit inside the case, Ryanair will ask you to check in the suitcase or purchase a seat upgrade to bring both on board. Vueling currently allows its passengers to take one piece of hand luggage plus a smaller item that can go under your seat. Please check carriers’ websites before you travel as baggage requirements change very frequently. Always pre-book bags that need to be checked-in the hold before the day of departure as it can get pricier on the day and if you leave it until the airport, you’ll be penalized. If you are travelling with more than one suitcase, arrive extra early at the airport. Some airlines close their bag drop facility 40 mins before departure time so if there are queues you might be caught out. It’s very important to check about oversize items such as bikes, ski and golf equipment etc as each low-cost airline has its own fees and policies. Ryanair charges 60 EUR per flight for a bike that must weigh less than 30kg (that rises to 75 EUR at the airport) so check whether it’s worth bringing the bike with you or hiring one locally. Ryanair charges 55 EUR for a musical instrument which increases to 65 EUR if you don’t pre-book it online. You may need to book a second seat for large instruments that you don’t want placed in the hold. Other sporting equipment can be checked in but check the fees before you book. Vueling also applies restrictions for overweight luggage and luggage that hasn’t been booked online in advance. You can pack your skiing, surfing, kitesurfing, snowboarding, biking and golf gear but make sure you check the specifics before booking your ticket. If you have a large musical instrument, you can also book an extra seat. Security checks for passengers are the same irrespective of what airline you fly with. Any liquids you are carrying must be transferred into a resealable zip lock bag for screening. Laptops and mobile phones need to be removed from backpacks and screened separately. Boots need to be removed and jackets need to be folded and placed in the screening trays. Belts also need to be removed. These security measures are the same for all airlines. 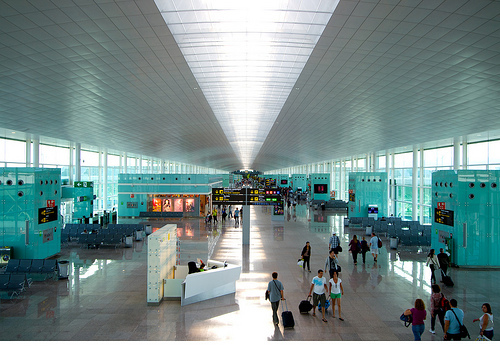 As a rule, aim to be going through the security check with at least one hour to spare especially if you are flying from larger airports such as Barcelona or Madrid. If you are flying from a smaller airport such as Santander or Valencia, we would still aim to be at security 45-60 mins before departure. Long queues at security and a long walk to the departure gate (low-cost airlines typically leave from the least convenient gates), could cause you to miss your flight. Remember many airlines want all passengers boarded and ready for take-off well in advance of the official departure time. Gates for many airlines close to all passengers, 20 mins before the flight departs. 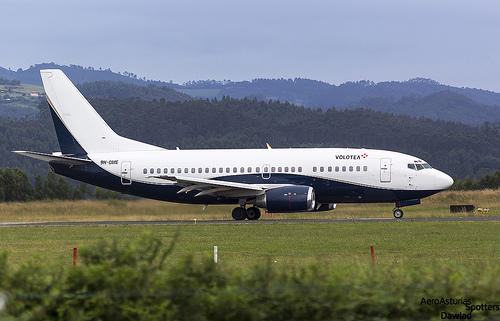 Punctuality is very important to low-cost airlines because if they miss their scheduled takeoff slot, the aircraft may have to sit on the runaway waiting for another slot for anything from a few minutes to an hour or more. Because low-cost airlines generally spend more time in the air (typically 8 flights a day) with shorter turnarounds than premium airlines, airline crew cannot delay planes for a few late passengers and risk delaying all subsequent flights for the day. If you have purchased a premium or priority ticket (Vueling calls them the Excellence Fare), you get to board the plane before non-priority passengers. For standard fare passengers, seats are pre-allocated but you will see a lot of people queuing to get on board the plane early and secure a place for their bag in the overhead lockers. If you board the plane last, you may not find room in the overhead storage compartment and may have to place this in the hold and collect the bag from the carousel. With the low-cost airlines, you’ll notice that customer services isn’t always top of the list. Crew often focus on getting the plane airborne to remain high on punctuality stats and may even bark a little to ensure everybody is seated quickly for take-off. Once airborne, you’ll hear lots of food and drink announcements, and with Ryanair, perfume offers, lottery scratch cards, and more throughout the flight. Inflight staff are incentivised to sell goods so as to boost profits on low cost fares. Low-cost airlines have a quick turn-around so you will be asked to leave the craft as quickly as you entered it. Low-cost airlines tend to dock at inconvenient gates i.e. 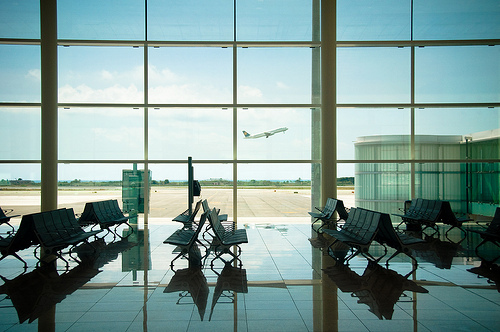 a distance from the baggage area, and usually require passengers to disembark by the steps to the tarmac from where they are either transported to the terminal by bus (larger airports) or they walk (smaller airports). If you checked in bags, or a bag was taken from you by crew at the Departure gate, or when you boarded the plane, you will most likely need to collect if from the carousel inside the Arrivals Hall. 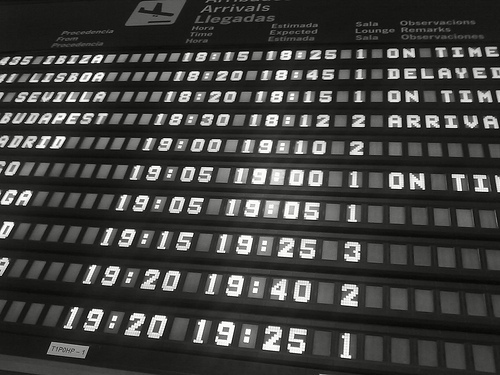 Some airlines Apps will give you visibility on where to pick up your bags – although the simplest way is to follow the screens at the airport. If you have a connecting flight, some airlines will check your bags through while others won’t. Ryanair treats every flight separately. And you will need to collect you bag, then exit the airport and re-enter Departures for a subsequent flight. Vueling does recognise connecting flights and if you are connecting to another flight at Barcelona, they will connect your bags so you only need to collect them at your end destination. Do make sure to double check this with the airline crew before you transfer through to your next flight. 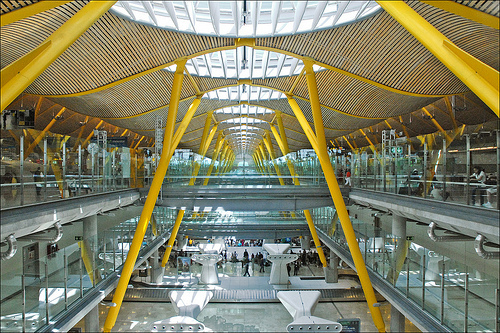 If you have just taken an internal flight in Spain (or anywhere else inside the Schengen area in the EU) you won’t have to show ID upon arrival into the Spanish Airport. You simply move on through into the public section of the airport’s Arrivals Hall. If you’re travelling with Totally Spain, we’ll have recommended a private driver to meet you in Arrivals and take you and your bags to your hotel. 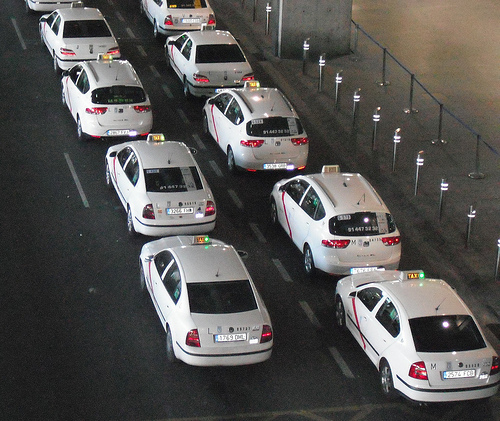 An airport transfer makes a lot of sense especially when travelling with a few people because taxis in Spain tend to have small luggage compartments. It can make more financial sense to book a transfer than pay for one cab for the passengers and another for the bags. And after that low-cost flight, why not treat yourself a little? See why we rate our private guides and drivers so highly here. 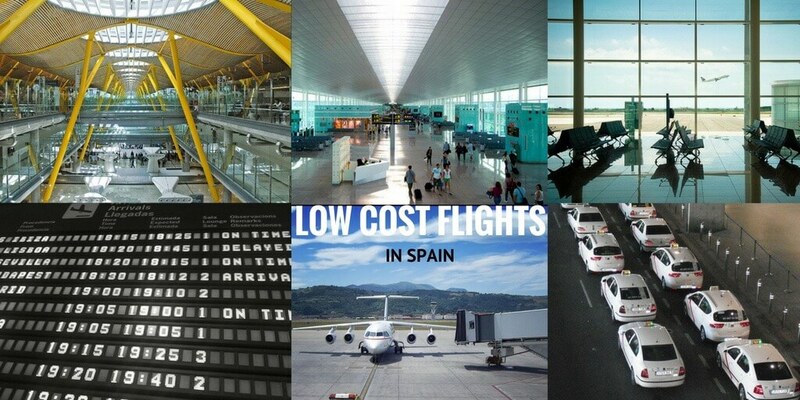 If you’re not familiar with the size and diversity of Spain (which is why we recommend taking a domestic flight in the first place) check out our guide to The Many Faces of Spain: North to South and East to West. And have a look at the Top 10 Cities also and our 21 Tips for Travelling in Spain. And let us know when we can start planning your itinerary! Posted in Active breaks, General Tickets, Getting Around, The Travel Industry, Useful Information and tagged airline, airport transfer, Arrivals, bag drop, baggage check, boarding card, carrier, check-in, connections, courier services, Departures, excess luggage, Iberia, low cost, no frills, oversize baggage, pricing, priority, Ryanair, seat, Security, tickets, Volotea, Vueling, wheelchair assistance, ziplock.